I wrote about my plan to start training for the BMO Half Marathon over here (haven’t committed to one plan yet but I’ve started on the Runners World Intermediate for now and may frankenstein a few together) and thought I’d update you a bit on how it’s going. Last weekend I set out with a new rout from my usual. 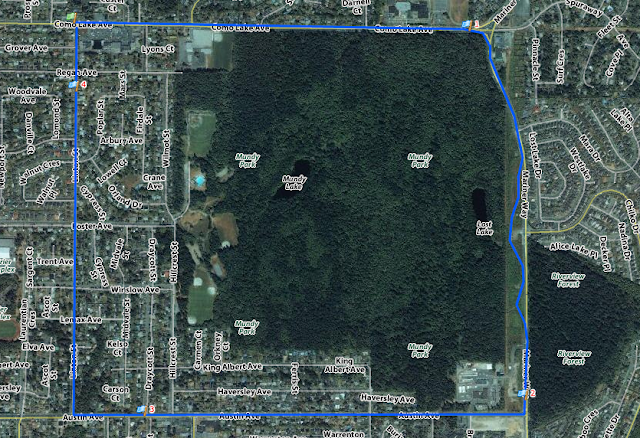 I live near a very dense 174 hectar urban forest called Mundy Park and I’ve run the trails closest to my house and taken cut thru paths and explored little mini trails before but it’s always seemed impossible to run all the way around the park for some reason. It’s 4 miles all the way around which is not a huge distance for me, I’ve run 4 miles on different routs before. For some reason those 4 miles intimidated me because once you get to the half way point you have no choice but to continue on and there is no easy rout you can cut through to make your run shorter. Coquitlam is known for bear sitings and I avoid going deep into forested areas for that reason. And then there are also the monstrous hills that I wont allow myself to walk. My first exploration out onto this new rout last week met me with a huge strip of black ice about 7 minutes out in which I had a magnificent and almost graceful fall landing on my left hip. Let me tell you, I’m not light. I knew it was bad when I couldn’t figure out how I ended up facing the other direction. I called my husband and told him about my fall and that I would attempt walking home. He offered to pick me up but I didn’t want him to load the kids up in the car and so I walked home, took Advil and inspected my developing bruise. It was red and very puffy and large and over the next days turned a few different shades of black and blue. The worst part was probably my left shoulder the next day which bared some of my body weight when I landed. I’ve been suffering residual aches and pains here and there over the past week but I would say I’m mostly healed up. Wednesday I decided to go a little bit further out and run 1 1/2 miles out and turn around and run back. It was supposed to be a 3 mile run but I was feeling so great I ended up at the 2 mile point and still feeling like I had lots of fuel in my engine so I continued on and committed to running a 4 miler around the park. I’m so glad I did that because it ended up being probably my nicest run ever. Not my fastest, my last mile was snail pace, but it was invigorating to explore an unknown rout and tackle mean hills My total elevation gain for that run was 285 ft and I burned 800 calories!! I really felt sore last night and had to pop some tylenol to let me get some sleep but I can’t wait to get out on that rout again on Saturday. Tonight will be a short treadmill run and it will pale in comparison but i’ll have my TV to keep me company. My last run was also the first time I used the heart rate monitor on my Garmin 110 and I was a little bit OCD about checking it, especially on the hills. It was good that it provided me with a distraction during the hills but I think I prefer using the heart rate monitor only once a week and only to see serial changes over a period of time since I don’t really train within any heart rate parameter. "New Items From Down Unda"
"New SE Scuba and Urban Yogini Messenger Bag"